WarLight has just been updated to version 2.03.0! This update finishes the new server platform that was discussed previously, and has a couple minor fixes/improvements. As discussed previously, WarLight now runs on the JVM. I’m still tweaking a few things to get everything running perfectly, but the early indications are that this will make the website much faster than before. What you see here is how fast the webservers are responding to http requests — one line per webserver. Lower is better (faster). This shows four days of traffic, so you can see that the website was slowing down during the day when lots of people were playing (it peaks around 1pm PST), and then speeding up at night when traffic is lower. You can see that, with the exception of the one big spike by one server in the middle, the servers are dramatically faster. 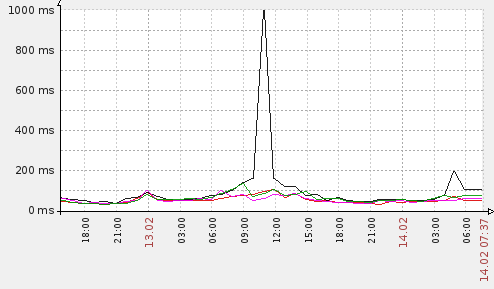 The spike was caused by a webserver using too much memory and eating into swap space, which hurts performance. I’m currently working on eliminating these kind of problems, and once I get everything working properly it should stay under 100ms permanently. All levels above 52 now require 500k fewer points to achieve. This was done to make level 53 a bit less steep from 52 (100k -> 225k instead of 100k -> 725k). If you are above 52, you may have noticed your progress in the current level to increase suddenly when this update went live. However, note that nobody gained or lost points from this change — your progress bar went up simply because the level requires fewer points. If you were close to getting the next level, you’ll show as past 100% in your current level. In this case, your level will go up the next time you receive any points. Any extra points will overflow into the next level, so nothing went to waste. Earlier this week, I made a bug-fix update to the Android app that should fix some errors that some people were getting. I also submitted a bug-fix update to the iOS app, but it’s waiting for Apple to approve it. I expect it to be live within a week. If you’re still experiencing any problems with the Android or iOS app after installing the latest update, now is a perfect time to report it! The ladder has been struggling to stay up-to-date lately. This isn’t caused by the switch to the JVM, but rather just because the ladders are growing beyond what the server that updates them can handle. Today’s update contains a few changes to help improve the ladder reliability, and I’ll continue to monitor it and make further updates if these aren’t enough. Over the last couple months, I’ve been experimenting with a new server architecture that aims to increase the speed and reliability of the WarLight server/website. It’s finally ready for production use, so I’m going to begin rolling it out. If all goes well, you shouldn’t notice any major differences, except that hopefully the site runs faster. I’ve tested it thoroughly, so I’m not expecting any problems. However, if you do run into a problem, please be sure to report it at warlight.net/ReportBug (or if the problem prevents that page from working, by e-mail to fizzer@warlight.net). For the technical folks, the new server platform is written in Scala and runs on the JVM. The old code was written in C# and ran in Mono. Mono has a bunch of issues that cause webservers to leak memory and sometimes freeze/crash, so WarLight is switch to the JVM. Initially, only one of WarLight’s six webservers will run the new code, so most people won’t notice anything. If you’re curious if you’re accessing the new or old, you can go to the Home -> Change History page and check the version: 2.02.2 is the old, 2.02.3 is the new.